KENNEDY SPACE CENTER, FL--SpaceX engineers replaced a suspect valve in an engine that triggered a last-second launch abort Saturday, carried out a data review to make sure there were no other problems and cleared the company's Falcon 9 rocket and Dragon cargo capsule for a second try Tuesday to kick off NASA's first commercial flight to the International Space Station. 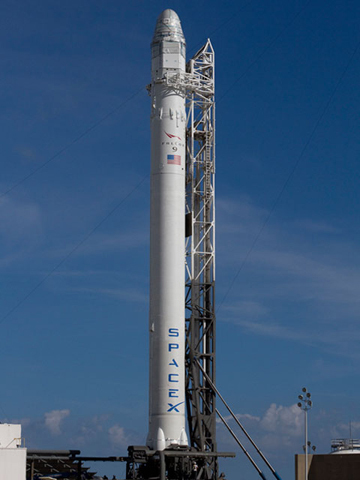 With forecasters predicting an 80 percent chance of good weather, the 157-foot-tall Falcon 9 was scheduled for liftoff from launch complex 40 at the Cape Canaveral Air Force Station at 3:44:38 a.m. EDT (GMT-4). As with Saturday's aborted countdown, the flight control team must launch the rocket on time, directly into the plane of the space station's orbit, to pull off the long-awaited rendezvous and docking. If the countdown is interrupted or held up for any reason, the flight will slip to Friday. This will be SpaceX's second Dragon test flight -- the third for the Falcon 9 rocket -- but the first to go all the way to the International Space Station. SpaceX holds a $1.6 billion contract with NASA to launch at least 12 unmanned cargo missions to the lab complex, but only after test flights confirm the safety and reliability of the rocket and cargo capsule. The test flights are being carried out under a contract valued at up to $396 million. Three missions originally were planned, but after a successful test flight in December 2010, SpaceX convinced NASA to combine the second and third tests into a single mission. As a result, the Dragon scheduled for launch Tuesday will spend much of the day Thursday carrying out maneuvers near the station to test the craft's flight control computers and navigation systems, and to check out the critical communications link between the station crew and the spacecraft. If all of that goes well -- work originally planned for the second of the three initiall proposed test flights -- SpaceX flight controllers will attempt the final phases of the rendezvous on Friday to complete the objectives of the third test flight, guiding the craft to a point within about 30 feet of the space station. At that point, flight engineer Donald Pettit, operating the station's robot arm, will lock onto the cargo capsule just after 8 a.m. and guide it to a berthing at the Earth-facing port of the forward Harmony module. "This is a fairly challenging mission, putting all those objectives together," said Mike Horkachuck, SpaceX project executive for NASA. "But we've done a lot of work with SpaceX and our mission ops teams are both coordinating very well and we believe we've got a good chance of meeting all those objectives with this flight." The station crew plans to open hatches leading into the Dragon capsule on Saturday to begin unloading about 1,500 pounds of equipment and supplies. Assuming an on-time launch and successful berthing, the spacecraft will be unloaded and detached from the station on May 31 and guided to a parachute-assisted splashdown in the Pacific Ocean off the coast of California. SpaceX originally hoped to launch the mission in early February, but the flight was repeatedly delayed, primarily to give engineers additional time to make sure the flight software was ready for action. During the first actual launch attempt Saturday, the countdown ticked smoothly to zero and all nine first-stage engines ignited and throttled up for liftoff. But at the last instant -- just a half-second before the Falcon 9 was to be released from the pad -- increasing pressure in engine No. 5's combustion chamber triggered a computer-ordered abort. "During rigorous inspections of the engine, SpaceX engineers discovered a faulty check valve on the Merlin engine," SpaceX said in a statement. "The failed valve was replaced on Saturday and after thorough analysis the vehicle has been cleared for launch."